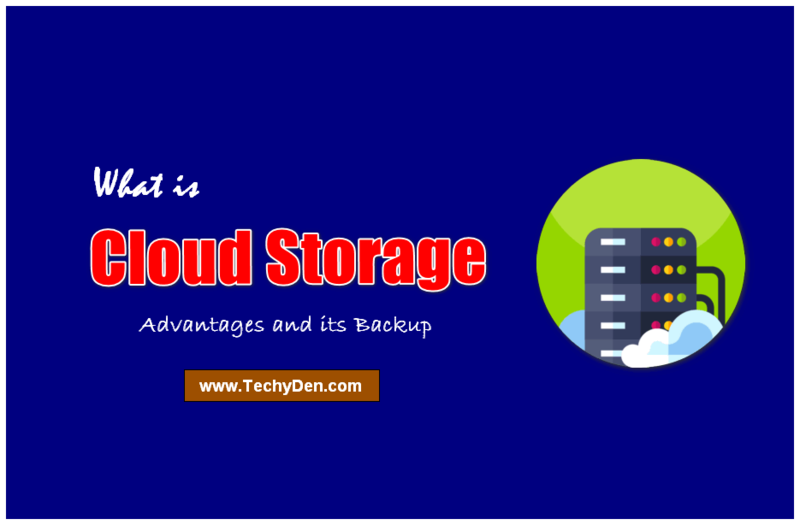 Cloud Storage: What Is Cloud, Advantages And Its Backup? Cloud is a term that refers to a technology that is very trendy. Many people use it and yet they are not able to clearly define. What is the Cloud and Cloud Storage? When do we use it? How can it be beneficial for your business? If you use any type of social media or data storage services online, you likely use the cloud without you realizing it. In this beginner’s guide, we discuss the who, what, where and why one of the most abstract terms of technology. What are the advantages of performing tasks on Cloud storage? What is the Magnitude of the Cloud? Is it the Cloud storage safe choice? What is Cloud Storage Performance testing? What are the key features of cloud backup? For example, Adobe has recently moved its creative services in the cloud. You cannot buy the Creative Suite (Photoshop, InDesign, etc.) in a box. Instead, you must pay a monthly fee to use each service. This is why it is now called “Adobe Creative Cloud” instead. Other servers in the network are responsible for storing the data. For example, when you take a photo using your smartphone, the image is stored on the drive internal memory of your phone. However, when you upload to Instagram, you upload to the cloud. So remember: It is a network of servers. Some servers provide an online service, such as Adobe Creative Cloud, and others allow you to store and access data, such as Instagram or Dropbox. Another example is Google cloud storage. There is a good chance that you use this daily without knowing it. Use Google Drive, iCloud or Evernote for best Cloud Storage for Personal Use. Whenever you store information without the use of internal data from your phone or computer, you are about to store in the Cloud storage. Computer Backup Services based cloud storage services. The decision of the company to “Cloud storage” is often motivated by financial reasons. Companies were forced to buy their own hardware, the value depreciated over time. But now, with the cloud, companies have to pay for what they use. Thus, the cloud is a good option to save thousands of dollars in business each year. There are more advantages of cloud computing performance tasks. Working on the cloud allows your company to be flexible, efficient and profitable. If your company has quickly need access to more resources, it is possible in the cloud. Conversely, if she needs to move to a lower level of consumption of resources, it can be done just as easily. Because of this scalability, the elasticity of the cloud is often compared to that of a rubber band. The history of cloud storage as far back as the 1950s. At the time, a computer was so great that it needed a whole room to contain it. Because mainframes (computers) were so expensive, organizations could not afford to buy a new one for each user. So they developed methods of “time sharing”, which allow multiple users to share access to data and CPU. Today, this idea of “timeshare” is the premise of cloud computing. The next major event in the history of cloud computing took place in 1969 when JCR Licklider developed ARPANET (Advanced Research Projects Agency Network) in the hope that one day everyone would be able to access data and programs anywhere. Despite these early advances, the Internet does not have enough bandwidth to make the cloud accessible to everyone and those to the 90s. Professor Ramnath Chellappa was the first to use the term “Cloud Computing” in 1997 and 1999 Salesforce became the first site to offer applications and software on the Internet. Amazon officially launched in 2006 its own platform called Cloud Computing Amazon Web Services (AWS). AWS provides Online Cloud Storage for web sites or client-side applications. Amazon is very good on Cloud Storage Providers for Business. There are likely using AWS daily. Social media sites like Instagram and Pinterest are using AWS to accommodate traffic and data. In fact, AWS propels hundreds of thousands of sites and large organizations in more than 190 countries worldwide. Nobody knows exactly how much space can be provided by cloud-based services like Google, Amazon or Facebook, but it is estimated that the cloud can store about 1 Exabyte (one billion gigabytes). But what is the size of an Exabyte? Exabyte memory can contain the same amount of data that 4.2 million hard drives MacBook Pro. This is a super mega storage space. Cloud storage is ideal for storing non-sensitive information, such as lists of tasks on platforms like Evernote. But unsurprisingly, the idea of storing personal information somewhere “in the cloud storage” makes many people suspicious. Some companies, like Google, to meet this concern accordingly. Google recently announced that it will automatically encrypt the data for users of paid services cloud storage. Every business all around the world depends on various applications to carry out their daily transactions. In order to deal with the fluctuating demands of the workplace, every application needs constantly to be prepared to deal with all sorts of extremities. Times like seasonal and promotional trading may have high demands as opposed to usual days when the demands are normal; so the apps must be capable of handling both. Incapable of doing so will lead to disconnected service, dissatisfied customers and above all loss in trading. To have successful regular business transactions, application and service availability needs to be ensured, so that you can retain your customers and take optimum benefit of the industry you deal in. Although this preparedness can come at an initial high cost, employing performance testing is the best way to maintain and monitor applications and server infrastructures that can imitate the load, contribute in the development of scripts for simulations, and understand user expertise and so on. However, with the latest development of cloud-based performance testing, the initial and ongoing costs can be reduced considerably, without compromising on any of the precision of the previous testing techniques. This advanced technology allows you to set up performance test scripts on load generators that are pre-configured systems, arranged on the cloud. Due to this, cost and effort of in-house test infrastructure are both saved. Moreover, cloud-based services help in diagnosing performance issues and identifying the nature and position of possible problems. Together with an on-site performance monitor, this can generate end-to-end transparent reports. Some other advantages of cloud-based testing are worldwide access, guaranteed performance, coverage of all sorts of enterprise applications and cost control. Firstly, coming to worldwide access; performance testing of a particular application across different geographies can be a time-consuming and extremely efficiency demanding affair. This becomes easy with the cloud, as data centres provisioned in the cloud are capable of executing this without any faults. In simple words, the cloud replicates virtual users across the globe, making performance testing effortless internationally. As the infrastructure of the cloud is capable of producing high demands necessary for performance testing of enterprises. This is because the data centres of cloud can compute power for virtual users ranging from 50,000 to 200,000 and if required beyond. Moreover, testing of peak load via the cloud allows you to run virtual tests on demand. All you have to do is schedule the test time, and the resources will take care of the rest. This flexibility helps you to avert long delays that are often experienced while testing from different locations. As we understand, all large scale enterprise applications today are not completely browser based. For which, you may have to test numerous aspects of a system for complete analysis. This is made possible with cloud-based testing that allows integration of on and off-premise setting and infrastructures. So, it is better to predetermine whether you will need a mixed model for your company, which is capable of combining IPs (Internet protocols) that support Java, DotNet, Oracle, Siebel, SAP, and COM with other protocols of enterprise applications. The advanced cloud-based testing is ideal when it comes to Web 2.0 apps testing, like Flex, AJAX and Silverlight are standards that can benefit from the cloud’s strong computing power. Cloud back up refers to backing up data and files on the internet using a storage service provider. There will be no need to store your valuable data in a hard disk or have any other tape backup. Now, you need not be tensed about not having the required files with you or fear of misplacing them. There is no added baggage of taking a CD or USB. Without data having corporate information, there will be no profitable business to function properly. At present, most of the business firms are using cloud backup to save their important files. There is no fear of data lost after introducing cloud backup in your computer. Thus, cloud backup becomes a valuable option to secure information in an easy way. Cost effective and reliable: By just spending hundred dollars per annum, you can store the full informative files and office data to be produced before clients whenever needed. Hence, no need to buy expensive equipment like tape backup systems. Company data are automatically transferred once you have installed the system in your office. Can be accessed anywhere: Its recovery system quickly restores the data anytime and in any location in a few seconds. The safe way to file transfer: The data is transferred to cloud vault and the decryption keys are with the user. It is more reliable and redundant than a tape backup system. Recover files quickly: By just clicking some keys on your computer, in seconds you can recover your files as it has inbuilt disaster recovery facility. In case any file is deleted accidentally, you can restore it from the storage software. The best beneficial point is even if the file is totally deleted from one device, it can be recovered from other devices. To have the system in good working order, you need to know its working system. In the market, there are many cloud backup software available. Select the best one, which fulfils your requirement, and downloads it. You can easily install it. Then create an account to log in to open files. After opening the main account download it to all devices you will use to open or store the data and files. You can even do it on your Smart Phones and tablets. The final procedure is to save the files. Double check that the stored files are systematically filed. When the devices are connected to the internet, you have access to the store and open files automatically in a few seconds. The best feature is that you can store massive informative data to be referred to whenever the need arises. The cost of all models are different, thus you can select the cloud service as per your requirement and budget. No matter what is the size of the organization, protecting confidential data is a risky issue. Cloud backup software helps in reducing the incoming problems regarding tape management and disaster recovery process. Finally, the cloud ensures your testing becomes cost-effective. Due to the elasticity of the cloud, your computing resources can be scaled up and down, depending on your requirement. So, it’s a pay as you use a model that works here, which is quite different from how things work in cases of only in-house scenarios. In such situations, a company has to pay and secure computing power for the entire lifetime of the app to support huge user tests. So, the cloud is a reasonable alternative you can go to for testing purposes.